Free Shipping Included! 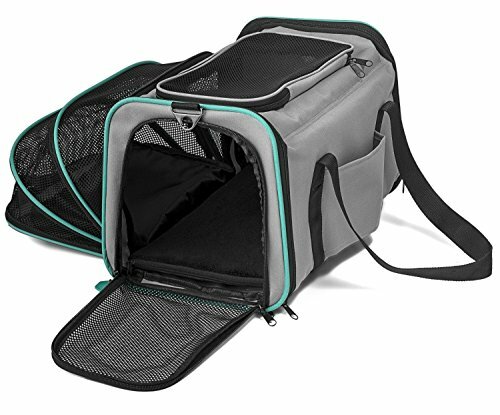 Pawdle Expandable and Foldable Pet Carrier Domestic Airline Approved (Heather Gray) by Pawdle at Animal Lovers Center. MPN: 1844. Hurry! Limited time offer. Offer valid only while supplies last. Expandable Pet Carrier Your Best Friend's Best Travel Companion. Traveling in high style? Check. Providing your pets with supreme comfort? Check. Expandable Pet Carrier Your Best Friend's Best Travel Companion. Traveling in high style? Check. Providing your pets with supreme comfort? Check. This clever carrier expands to nearly double the interior space with the pull of a zipper. And when it's time for compact storage/carrying, zip it all up to get a truly compact laptop bag-sized case. Your pets are sure to enjoy the superior breathability provided by the durable mesh panels, while you're sure to appreciate the removable, washable fleece pad. If you have any questions about this product by Pawdle, contact us by completing and submitting the form below. If you are looking for a specif part number, please include it with your message.